Welcome to Better Than It Looks, a series in which we discuss the recipes we tried (and maybe failed) to execute, and the foods that were served to us by someone perhaps more talented than ourselves. “Wtf is a sunchoke,” I Gchatted a couple weeks ago, truly unsure of whether or not there was an answer. You’d think it’d be rare in this age of globalization—when our bananas come from Equador and our avocados come from California—to come across a food you’ve absolutely never heard of. But since joining a CSA several seasons ago, “Wtf is x” is something I’ve found myself chatting quite a bit. Luckily, the internet provides, and I soon learned that sunchokes aka Jerusalem artichokes are similar to potatoes (excellent) but also can have some um, unpleasant side effects. No problem; I made a mental subconscious note to cook these during an evening when I was home alone and not entertaining. Though there are several potato-similar ways to cook sunchokes (mashed, roasted, blanched then roasted), I settled on basically quickly home frying them with some garlic. I didn’t peel them, as practically everybody who’s anybody notes that the skins are edible, and peeling them just makes it so that you have less to eat. I was warned beforehand to watch the sunchokes closely, as they brown quickly, and I think I could have heeded this warning better; hearing that they were similar to potatoes made me feel as though I had a little more time than I did, and they were definitely a little on the singed side. In hindsight, I see that I could also have added some other herbs and spices besides salt and pepper and olive oil, but why mess with the three things I use to make every meal? Paired with my favorite combination of arugula and a salty cheese (in this case feta) topped with an olive oil/lemon/garlic dressing, I cannot say I was displeased with the result. Would I serve it to a companion? If I wasn’t worried about potentially ruining the romantic vibe of the evening, yes, especially with a little less cook time on the sunchokes. 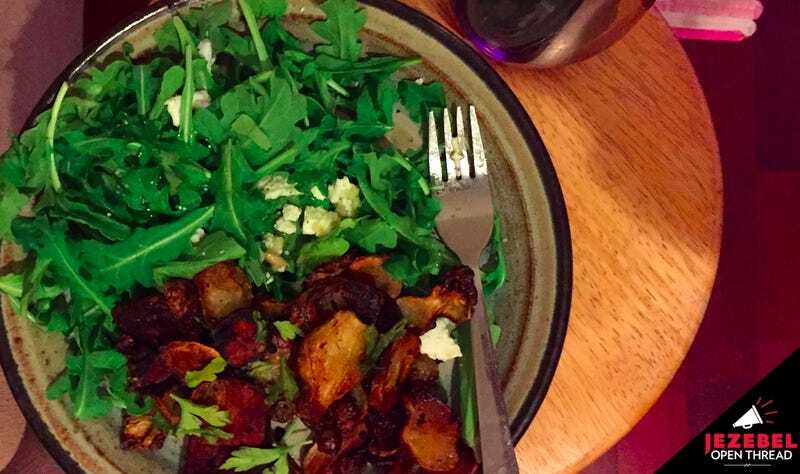 If sunchokes were more readily available, I’d classify this as a great, easy meal to throw together at the end of a long day, something Giada would recommend and I would scoff at, the kind of thing The Today Show smilingly pushes on you that you know you’ll never try. A glass of red wine (the one seen above is from a $10.99 bottle of Malbec) helps too. What did you consume this week? Did it include spices other than salt and pepper? Was it yet another variation on the same thing you make for yourself on the regular?